Will I, won’t I? Well, actually, I will: eat in a vegan fashion for four weeks that is, but just not at the moment. I had thought I might do so in January, but I have decided against. Truth be told, every time I contemplate a meat, poultry, egg, and fish free four-weeks (and these are just some of the food stuffs I would need to forego) I wonder might it be dizzingly difficult and would I have will-power wobbles and throw in the towel in the first week. Quite likely, so I need to get my head properly wrapped around the idea and suss out some vegan recipes before I give it a go. Because the trouble at the moment is that every time I read a recipe I haven’t made before and think oh, that would be good for my vegan interlude when I examine closely the list of ingredients I usually discover it has some ingredient that makes it vegan unfriendly. A case in point is this chocolate granola which has honey in it, and honey is a vegan no-no. Anyway it sounded delicious so I made it and it was fairly ambrosial. The recipe comes from Trish Deseine’s ‘The Paris Gourment’ which isn’t a cookbook but a comprehensive guide to the best of Parisian cafés, restaurants, shops and other food havens but it also includes some recipies and tips. 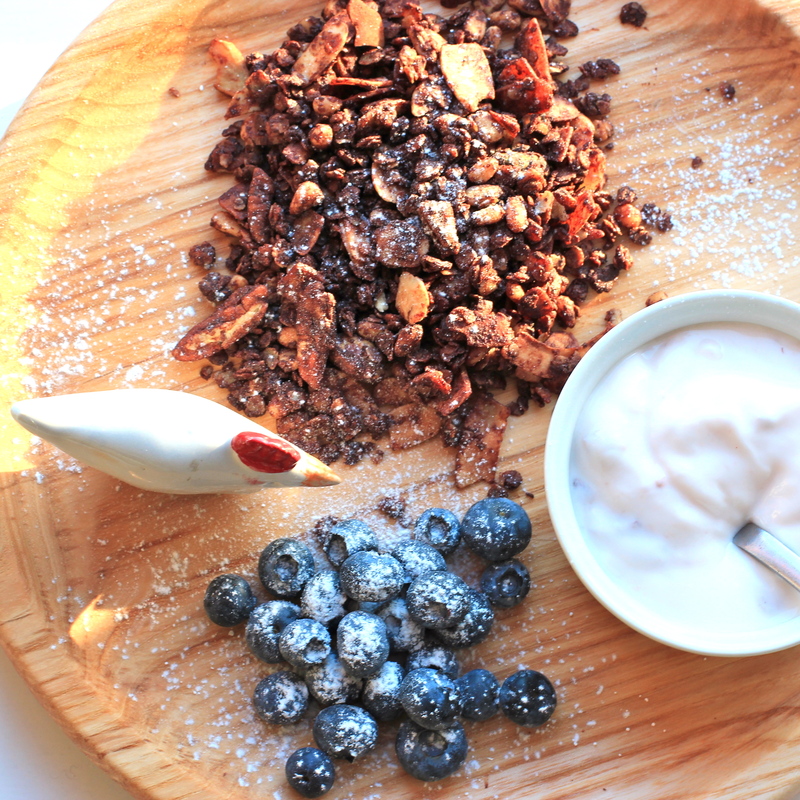 Making the chocolate granola is super simple. Mix together all of the ingredient and spread them out on a large baking sheet. Bake until they are golden brown – about 5 – 7 minutes. Shake the baking sheet so the mixture doesn’t stick together. Bake for a further five minutes and then leave to cool. Serve with fruit and yogurt. This recipe looks wonderfully simple and delicious. Matt loves to eat granola for breakfast and I love it as a snack in the afternoon. I admire your goal to eat vegan for four weeks. I don’t think I would have the will power to make it through more than a week! It was so very easy to make and totally yummy. I am not sure about my will power when it comes to giving up so many food foodstuffs( especially eggs and fish) which is why I didn’t dive in and start eating in a vegan fashion in January. But I am going to give it a go. Chocolate granola! Yum! I would find it very hard to give up honey. At the moment, anyway, because I am in a very honey phase of my life. What about one vegan meal a week to start with? Perhaps you already do that? I used to have a house worker from Ethiopia. She shared our meals so when she was fasting for religious purposes we always had meals without meat, dairy or eggs. I suppose that was vegan. It was challenging at first but very enjoyable. I was just thinking about possibly making some chocolate granola the other day and voila here is a recipe. I had thought that the recipe would use cocoa powder but love that this uses bar chocolate. Vegan, well I would last maybe half a day or a day at the most. I applaud you for doing it when you do. I like my dairy too much to give it up. It’s the only recipe that I have come across that uses chunks of chocolate rather than cocoa and I confess I did worry about the ratio of chocolate to other ingredients as it seemed high. But it worked fine and the chocolate granola was delicious and I very quickly eat the batch I made! – and a lot more sirups, depending on what for. I admit my culinary crush of the moment is coconut sugar; I don’t eat anything else in the sweets department. coconut sugar has a fantastic, rich caramel-like taste and is really good for our health. Thank you for the detailed review of subs for honey, you are a veritable mine of information and I appreciate the time you took to pass it on. make sure to buy organic coconut sugar! Well now, this is a bit decadent, isn’t it??!!! Can’t wait to make it! Yes highly decadent but also delicious! I like chocolate and this sounds like a wonderful treat and very simple to make. Thanks! Sounds and looks delicious. Of course, I’m up for anything chocolate. Me too! It is delicious and, of course, I used chocolate with a seventy per cent cocoa content. Anything else is just not chocolate! That is the plain and simple truth.